Moscone Center is within walking distance from Union Square and the San Francisco Financial District. BART (East Bay/SF Airport) and Muni Metro trains run under Market Street. Powell Station and Montgomery Station are the nearest stops for both systems. F-Market & Wharves streetcar stops by . The nearest cable car stop for Powell-Hyde and Powell-Mason lines is at Market and Powell, above BART and Muni Metro Powell Station. 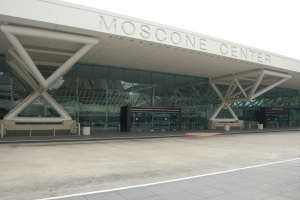 The nearest Caltrain (Peninsula/San Jose) stop from Moscone Center is 4th & King Station. Muni bus 30 and 45 provide connection via 3rd/5th streets. Muni Metro Judah and Third Street lines provide connection via stations under Market Street. To walk from Caltrain, proceed north along 4th Street toward Market Street (15 min - 20 min walk to Market). From either the Ferry Building or Pier 41, transfer to F-Market & Wharves streetcar to reach Moscone Center. Downtown is served by various bus systems from the North Bay and the Peninsula. Golden Gate Transit and SamTrans buses stops along Mission St. Buses from the East Bay stop at the Transbay Transit Center further north. This page was last edited on 4 January 2015, at 12:39.